This heavy duty stacking chair from OFM features a reinforced tubular steel frame for years of dependable office use. Other features include thick, foam padded seat and backrest cushions, your choice of (5) different stain resistant commercial grade fabrics, foam padded upholstered armrests, waterfall seat edge, built in floor glides, stackable up to (4) chairs high. 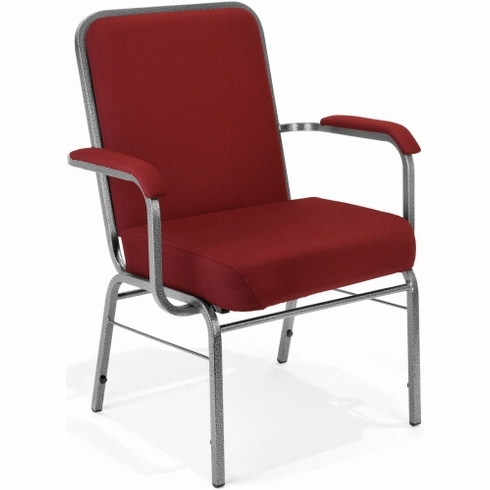 These heavy duty stacking chairs from OFM meet or exceed ANSI/BIFMA standards. Dimensions: Seat Size: 20.75"W x 17"D. Back Size: 20.25"W x 19.25"H. Seat Height: 18.75"H. Overall: 35.5"H x 29.25"W x 25.25"D. Limited lifetime warranty from OFM. This chair normally ships in 2-3 business days.